We’ve talked before about how you pay twice for your water: when it comes into your house, and when it leaves, as sewage. While many of us focus on the consumption side of things — which is important — the other end is also a great opportunity to save water. And when you save water, you save money. Here’s a look at water-saving strategies for your toilet — and how much each one can help you save on your water and sewage bills. A family of four averages about five flushes a day per person — a low estimate, as we’ll assume the other one to three average daily flushes happen at a school or work toilet. A simple, inexpensive and easy way to reduce the amount of water your toilet uses is to minimize the amount of water needed to fill its tank after each flush. Two ingenious products, less than $5 each, can help you do just that. A fill cycle diverter works by diverting some of the water that would normally fill the bowl into the tank instead. This fills the bowl more quickly and saves up to a half-gallon of water per flush. A displacement device takes up space in the tank, reducing the amount of water needed to fill it. My frugal father used to put a brick in the tank of each of the toilets in our house. I’ve also heard of people using plastic milk jugs filled with water. If you’re looking for something a little more sophisticated, try the Tank Bank, a tool that clips onto the side of your tank and displaces approximately 0.8 gallons of water with each flush. These tools pay for themselves in very little time. Used in combination, they save approximately 1.3 gallons per flush. With these two tools, the average family of four would save 26 gallons of water a day, or 9,490 gallons a year. Estimating a sewer usage rate of $3.59 per hundred cubic feet (HCF; the equivalent of 748 gallons), that’s $45.55 a year in savings! This method is not for everyone, but it is certainly a no-cost and easy option. If you have your own bathroom or your family is on board, consider following the saying “If it’s yellow, let it mellow.” In other words, flush only after “depositing” solid wastes, and let liquid waste sit. Make this strategy more appealing by keeping the toilet seat down or modifying your approach to flushing after every other liquid waste deposit. The level of commitment is up to you, and even the slightest adherence will reduce your water consumption and thus your water bill. Just be conscious of how much toilet tissue is accumulating so you avoid clogs, and keep a plunger handy, just in case. And, if you’re afraid of what guests might think, only practice this technique when you’re not expecting company. Our hypothetical family of four, with five bathroom trips a day per person, could cut their usage from 20 flushes per day down to anywhere from four to 10 flushes per day. Let’s say they now flush an average of 6.5 times per day. Depending on their toilet’s efficiency (gallons per flush range from 1.5 to seven), their savings will vary. If their toilet uses 3.5 gallons per flush, suddenly, instead of 7,300 flushes and 25,550 gallons used per year, they’re looking at 2,373 flushes and 8,305 gallons per year. Using San Diego’s sewer usage rate of $3.59 per HCF, using 17,245 fewer gallons of water every years means they save roughly $82.76. What is the first thing you do when you take a shower? You turn on the water to let it heat up. While you’re stripping down to your birthday suit and flexing in the mirror, all that water is running wasted down the drain — and you’re paying for it. Here’s the solution: Stick a bucket in the shower to collect this water. Once your water is hot, remove the full bucket and put it aside. Then, the next time you need to flush your toilet, press the handle, remove the tank cover and pour your bucket of water into the tank. Not only are not paying for the wasted shower water that would have gone right down the drain, you are now also not paying for the water to fill your toilet bowl. Huzzah! If you happen to have a bucket in your basement or garage, your initial investment could be $0. Otherwise, don’t spend more than a couple of bucks at the hardware or dollar store. One with a pour spout is ideal. If storage is at a premium, you may want to spring for a collapsible bucket. Let’s say it takes one minute to warm up your shower. An average showerhead uses 3.5 gallons per minute, so you’ll be surprised to see how much water is in your bucket. If you take seven showers a week, you’re looking at saving 1,274 gallons of shower water a year — plus reusing them and saving another 1,274 gallons in toilet flushes! For savings, we’ll use San Diego as an example. The sewer rate is $3.59 per HCF. Water is a bit more complicated because the cost depends how much you use, but we’ll use an average of $5.82 per HCF. Your savings would be $9.91 for water and $6.11 for waste water. That’s a total of $16.02, and if you shower more frequently or have an older showerhead, you could be looking at closer to $25 or even $30 in savings. A word of caution: Buckets filled with water present a drowning hazard to children and infants, so keep the bathroom door closed or take other steps to ensure the safety of little ones inhabiting or visiting your house. Dual-flush toilets have become more mainstream and affordable, so you might be ready to take the plunge and install one. For example, Home Depot’s options start at $94. Manufacturers say they’ll save you roughly $14 to $20 a year on your water bill. Municipalities all over the country offer rebates if you upgrade from an older toilet to a more efficient model. Check with your city government to see if they partner with WaterWise programs, and if they aren’t, challenge them to start. With rebates in cities like Seattle clocking in at $75, you can make your money back within the first year. After that, the savings continue to roll in year after year. If you want to jump on the dual-flush train without investing in a whole new toilet, try a dual-flush conversion kit. Amazon’s options start around $15. Again, you’re looking to make your money back on the initial investment in only a year. Not ready to commit to a whole new toilet? Check out this ingenious device called SinkPositive. It’s perfect for guest bathrooms and powder rooms as it immediately adds a space-saving sink to any toilet. When you flush the toilet, water first runs through a faucet to let you wash your hands, before it drains into the toilet tank. The water coming into the faucet is just as clean as water from any other sink, but it’s does double duty by then filling the toilet as well. If you use one-half to one gallon of water per hand washing, per visit to the bathroom, you could save 3,650 to 7,300 gallons or $28.40 to $56.80 a year. While not for the faint of heart, these are definitely the most eco-friendly options and provide the lowest lifetime costs. For more information, I highly suggest checking out The Humanure Handbook. It’s a fascinating read. This method might only work for the truly adventurous, but they’ll save roughly $125 a year. 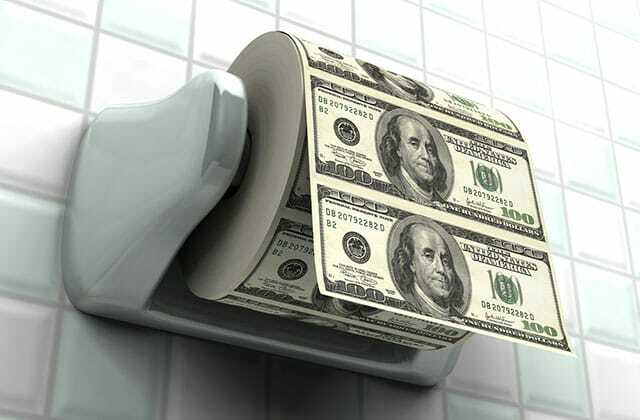 Your Turn: Do you use any of these strategies to save money with your toilet? Shanna Remke is a wife and mother whose years of raising a family on one income has helped her to hone her money-saving skills. She has a passion for stewarding money and the planet well and loves finding new and creative ways to pinch pennies while lessening her ecological footprint.